While in a random, desert-like part of eastern Oregon, we came upon a very unusual area. 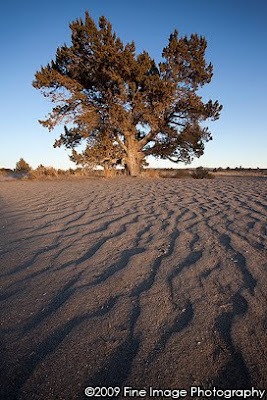 It was a sea of sand dunes... with trees growing in it. Never in any of my travels had I seen this. It was exciting because it offered the opportunity to create some unique photographs. 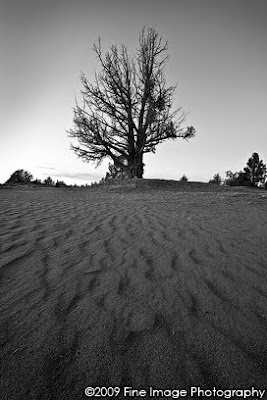 I wasted no time in doing so, most often using the ripples in the sand as foregrounds leading the eye into the photograph towards the main subject: the trees, of course. While we were busy shooting away, Marc taught me something that I had never really considered. He said that, most times, dead trees -- not living ones -- made the most interesting subjects. As soon as he said it, I knew he was right. It made perfect sense, I just hadn't really thought about it. Dead trees often have a peculiar aura -- they tell a story. We soon came upon a dead tree that drove the point home. Although the living trees that we had been shooting were definitely photogenic subjects, this dead one was clearly more interesting. It seemed ominous, almost... wise. Something about it just made it seem more... intriguing than the other trees. So, time for you to see for yourself. Below are two of the trees I shot that day. Both are similar compositions, but I think you'll agree that they have are totally different images. What do you think? Can you see the difference I'm talking about? Look at 'em for awhile. I think you'll see it. Enter your email address and new posts will automatically be sent to you. You can unsubscribe anytime you wish. NO SPAM GUARANTEED.